Shop Local !! 2 Locations in Danville & Walnut Creek, CA. Let’s talk about your STAINMASTER® Carpet & HARDWOOD Flooring Project !! – Call 925.314.9663 or email now to begin a discussion. #1 Rated Carpet & Hardwood Flooring Company – Our Danville,CA Location is OPEN 7 Days a week & Walnut Creek Location is OPEN 6 Days a week !! Diablo Flooring is an independent, family owned company providing comprehensive carpet and flooring services for residential and commercial buildings in the Bay Area and East Bay communities. We have many carpet, hardwood, laminate and vinyl products to choose from along with our experienced, professionally trained technicians enable us to install many pet friendly carpets like, pet-protect, stainmaster, nylon, wool, pattern, plush carpets, laminates, lvt, vinyl, hardwood, solid, engineered, wide plank flooring for your home or office. Our 2 locations in Danville CA & Walnut Creek CA allow us to serve the communities of Castro Valley, Pleasanton, Livermore, Dublin, San Ramon, Danville, Blackhawk, Alamo, Walnut Creek, Concord, Clayton, Lafayette, Orinda, Moraga to name a few and many more Bay Area, Tri Valley, East Bay cities. We work with homeowners, realtors, contractors, architects & interior designers and offer guaranteed great prices on our large selection of name brand StainMaster carpet and designer hardwood flooring. With 2 stores, we can get the lowest prices from the best carpet & hardwood flooring manufacturers – and pass the savings on to you. 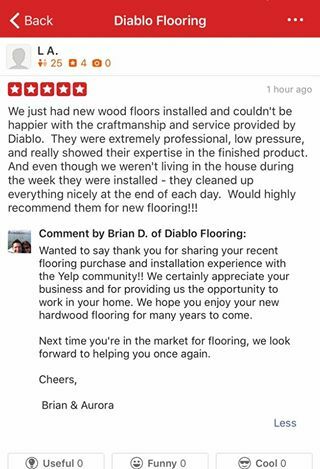 Owners / Founders, Diablo Flooring, Inc.